Repeat after me: this is not a health food. Despite it being a breakfast food, this is not the type of thing that rings a golden halo of healthy smugness over your head as, say, a bowl of bran cereal or a tall glass of fresh pressed green juice would. It is exactly the type of thing, however, that will have you dancing around in tippy-toes of joy in front of your oven as you eagerly wait for the timer to go off. It is the type of breakfast that pulls bleary-eyed sleepers away from happy dreams and warm beds and into the kitchen on cold mornings. This is dessert showing up as breakfast at your doorstep on Halloween. I saw these on apartment therapy a few weeks back and promptly booked marked them, knowing that I would have to have them. I made them for a leisurely Sunday breakfast and was so glad that I did. As they do require some advanced prep work, they are not a spur-of-the moment breakfast, but they are perfect for special occasions like holidays or birthdays. Be aware that this recipe makes a lot of rolls. If you are not feeding a crowd, I recommend halving the recipe. I made the whole thing and was able to send one pan full over to our neighbors to enjoy, as well. To adapt the recipe, I swapped out the dairy ingredients for their vegan counterparts. I also swapped out white flour for a mixture of whole wheat and spelt flours (to attempt to assuage feelings of guilty decadence), cut down the sugar by just a touch, and I swapped in Rice Nog for the milk to add just that much more holiday goodness to each bite. I also swapped out individual spices for pumpkin pie spice because I love that stuff at this time of year. I also have a confession to make. I took a few of the leftover rolls the next day and slathered them in some maple butter cream frosting I had leftover in my refrigerator from a batch of cupcakes I had made earlier in the week and served them for dessert. Oh. My. Goodness. Over the top decadence. My sweet tooth swooned. And that is how you make a food item multi-task. Sprinkle the yeast over the water and let it sit a few minutes until the yeast is dissolved. Meanwhile, warm the Rice Nog and Earth Balance in a small saucepan on the stove top until the EB is melted. Combine this with the sugar in a large heat-proof mixing bowl and stir until the sugar is completely dissolved. Let the Rice Nog mixture cool until it is just warm to the touch – NOT HOT. Then stir in the yeast and the pumpkin. Add the salt and all of the flour all at once, stirring until all the flour has been absorbed. Squish it between your hands if you’re having trouble incorporating the last of the flour. The dough will be sticky, but should come together in a shaggy ball. If it’s still more the consistency of cookie batter, work in an additional 1/2 cup of flower. Cover the dough and let it rise for 1-3 hours. Do not panic if it does not get very large in bulk. It will be OK. After letting it rise, you can punch the dough down and refrigerate it overnight or continue shaping the rolls. To shape the rolls (either immediately or with the refrigerated dough), sprinkle your work surface with a little flour and dump the dough on top. Pat it down into a rough rectangle and then use a floured rolling pin to roll it into a rectangular shape about a half an inch thick, longer than it is wide. If the dough gets sticky, sprinkle a little more flour on the dough’s surface and on your hands. 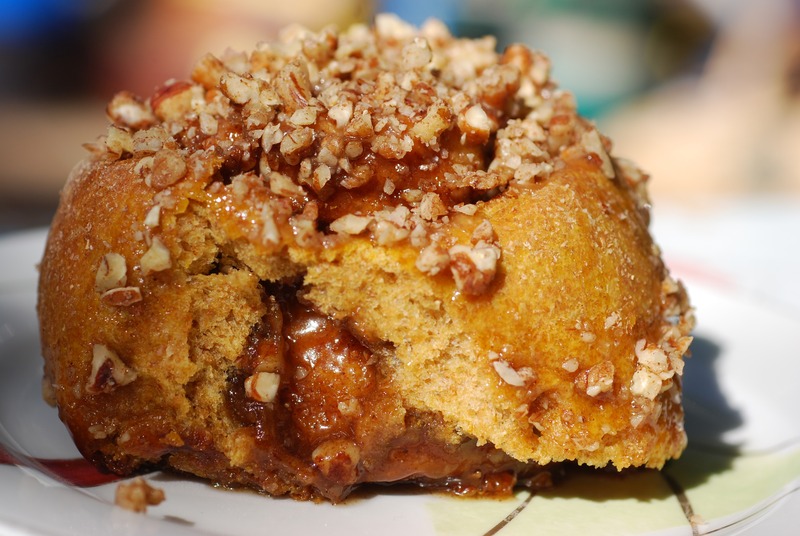 Melt the Earth Balance in the microwave and stir in the brown sugar and the pumpkin pie spice. Spread this over the rectangle of dough, leaving an inch of bare dough at the top. 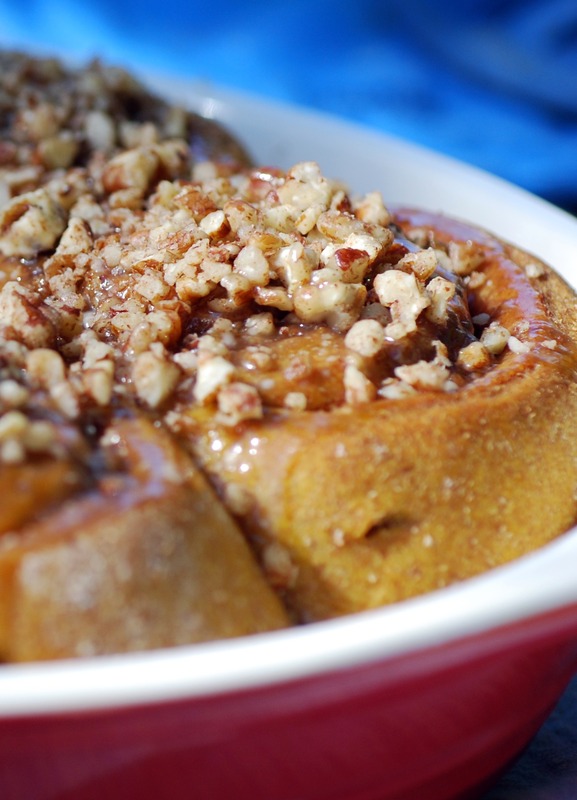 Sprinkle one cup of the toasted pecans over the dough, if using. Starting at the edge closest to you, roll the dough into a cylinder and pinch it closed at the top. Rub a tablespoon of soft Earth Balance into the bottom of two 9×13 baking dishes, two 9-inch cake pans, or a combination. (I used one oval baking dish and one glass pie dish) Using a bench cutter or a sharp knife, cut the cylinder into individual rolls 1 – 1 1/2 inches thick (confession: I made mine bigger, probably in the 1.5 – 2” range). Place them into your baking dishes so they have a little wiggle room on all sides to rise. Cover them with a clean kitchen towel and let them rise until they fill the pan and look puffy, 30 minutes for already-warm dough and 1 hour for dough that’s been refrigerated. About 20 minutes before baking, begin heating the oven to 375°. When the rolls are ready, bake them for 20-25 minutes, until the tops are golden and starting to look toasted around the edges. Rotate the pans halfway through cooking. While they are baking, prepare the glaze. In a small saucepan over medium heat, combine the Rice Nog and Earth Balance. When the EB has melted, add the brown sugar and salt. Stir until the brown sugar has melted. Stir in the powdered sugar. This should form a thick but pourable glaze. I love your ‘these are not healthfood!’ reminder! I just had to do that with the ganache I posted – this is a sometimes food, people! These look so good, I can almost smell them from here! 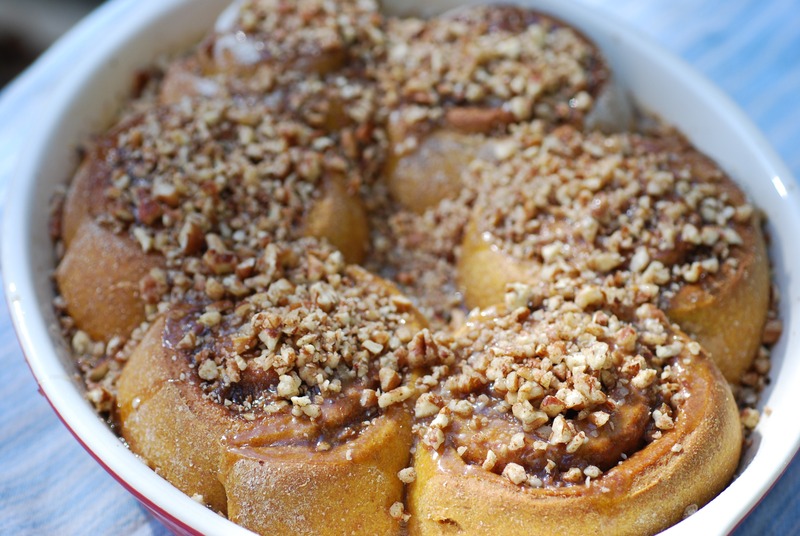 I’m also bookmarking, because they would make wonderful holiday entertaining breakast treats! These sort of recipes are the reason that I swayed me to move to Maui is the first place. If only I could be that lucky neighbor…..
Yum! I want to make these next weekend! Oh, yum!!! I love Apartment Therapy – especially their kids site, Ohdeedoh. Great job on these buns!! These look perfectly healthy to me! 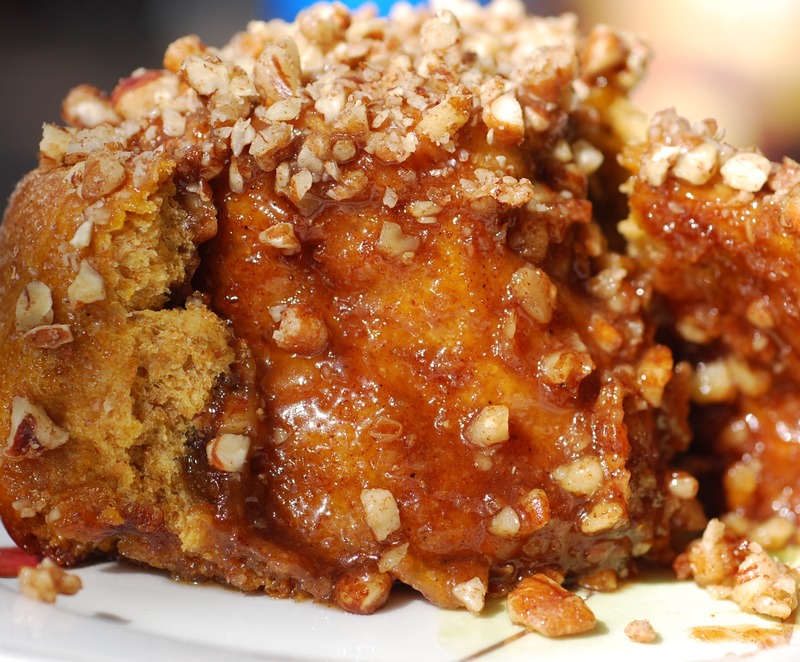 I love pumpkin rolls & these look delish! Seriously delicious and pre-veganized for your enjoyment!